Piaffe sequence showing the stepping from one diagonal pair to the other (3 left pictures) and the moment in which the limbs are suspended at the highest position during the swing phase (right). Shown are 1996 Olympic gold medalists Isabell Werth and Gigolo FRH. Last month we defined suspension as a period when none of the horse’s limbs is in contact with the ground. 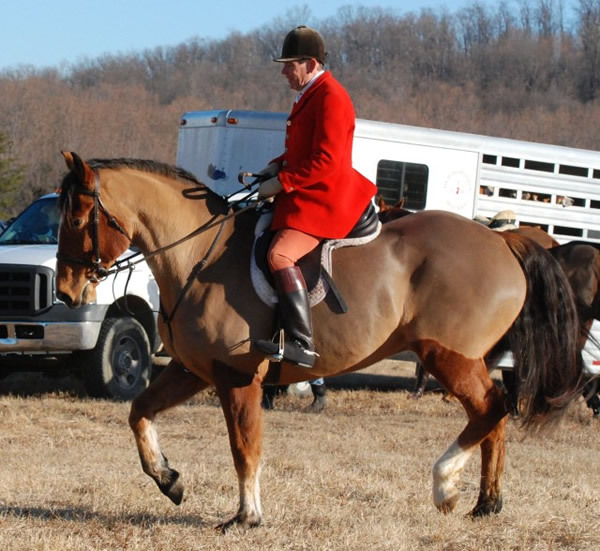 Suspension is a characteristic of some gaits; the trot has two suspensions in each stride, while the canter has only one. Other gaits, like the walk, don’t have a suspension. Recently, it has been reported from two different gait laboratories, the McPhail Dressage Laboratory in Michigan and Mikael Holmstrom’s lab in Sweden, that the piaffe has no suspension. This seems to have created considerable discussion, maybe even disbelief in some circles. Part of the confusion between which gaits have and don’t have a suspension surely lies in the terminology. As we’ve seen, the biomechanical definition is a period during which none of the hooves is in contact with the ground. However, dressage terminology may associate other characteristics of movement with the word suspension. One of these is the up and down motion of the horse’s trunk during each stride. In the leaping gaits this motion is exaggerated with the horse’s body rising during the suspension and sinking during the support phase. In the stepping gaits the body rises as it passes over the supporting limb and sinks as the weight is transferred to the opposite limb. Let’s use the term trunk oscillation to distinguish this up-and-down movement of the horse’s body from true suspension. Another possible area of confusion is in describing the movement of the limbs during the swing phase. In the walk, trot and canter, the hoof follows a smooth trajectory as it moves continuously from lift off until contact with the ground. In passage and piaffe, the hoof is raised, then held momentarily in an elevated position. This is what makes these gaits so majestic. Although the hoof is suspended in the air, this is not the same thing as a biomechanical suspension. Let’s call this action hovering. Passage is characterized by having a prolonged suspension, marked oscillations of the trunk and a hovering action of the limbs. Piaffe has an obvious hovering action of the limbs and, in horses that move through their backs, it shows oscillations of the trunk, but piaffe does not have a suspension. I say this with conviction having analyzed slow motion videos of all the individual medal contenders in the Barcelona and Atlanta Olympics, plus a number of highly trained Andalusian and Lippizan horses. All of these horses performed the piaffe as a stepping gait without a period in which all four hooves were clear of the ground. During each stride the trunk rises as the weight shifts from one diagonal pair of limbs to the other, then sinks as the new diagonal accepts the horse’s weight. 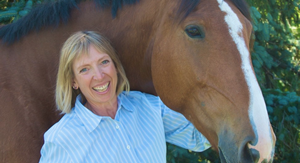 Try this exercise to give yourself a better feeling for how the horse piaffes. Stand on the floor on your left foot and rise up onto tiptoe. As you reach your highest position, put your right toe on the ground and shift your weight from left to right toe. Gradually allow your right heel to settle onto the ground, while bending your knee and hip joints. Reverse the motion, rising through your hip, knee and ankle joints until you’re on tiptoe, then smoothly shift your weight onto your left toe and repeat. 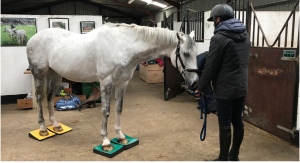 Initially you may have problems balancing (so do horses) and in making a smooth weight transfer but keep practicing until the movement starts to flow. This is the action of piaffe. If you’re still having difficulty accepting the notion of a suspenseless piaffe, replay videos in slow motion or single frame advance. If you find a horse that has a true suspension, that is with all four hooves visibly clear of the ground, during the performance of piaffe (not half steps), please send me a copy of the tape. Having said this, I should comment that just occasionally Rembrant showed a very short suspension but only on one diagonal. Of course, one of the criticisms of Rembrant’s piaffe was that he was trotting on the spot rather than showing the true characteristics of piaffe. The FEI rules describe piaffe as “a highly collected, cadenced, elevated diagonal movement”. It differs from the description of the passage which is “a measured, very collected, very elevated and very cadenced trot”. This leaves open the possibility that piaffe is not a trotting gait. However, it is also stated that in piaffe “each diagonal pair of feet is raised and returned to the ground alternately, with an even cadence and a slightly prolonged suspension.” In the context in which it is written, it seems likely that suspension is refering to the hovering motion of the limbs. The idea that piaffe is a stepping gait rather than a leaping gait is not a new one. The Manual of the German National Equestrian Federation recognizes the fact that there is no suspension in piaffe, and classical drawings of piaffe as performed at the Spanish Riding School show a stepping type of gait. 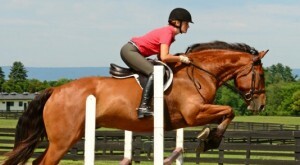 In conclusion, a suspension is an integral part of the canter, trot and passage. The piaffe, however, does not have a suspension and should be classified as a stepping gait. This is one of the differences between piaffe and the other diagonal gaits (trot and passage) and is one of the reasons why piaffe should, perhaps, be regarded as a separate gait.